I am using Konsole as my terminal emulator in Fedora 28. I was tinkering with some system settings and they seem to have added few whitespaces to my Konsole. I am not messing around. Those white spaces are not added by me. Every time I open the Konsole they are there. I have tried fixing/deleting Konsole config files from the location below but to no avail. I'd guess that you and diddyonkde in viewtopic.php?f=227&t=153628 are experiencing the same problem. Could it be that you changed PS1? I don't know if Fedora offers a GUI to set the prompt but Konsole usually reads the ~/.bashrc file which includes PS1. The 'Prompt String' variable PS1 is responsible for the look of your standard prompt. and you get a new prompt with or without white space. There's more to it than that. Check the bug report and the video that diddyonkde posted in viewtopic.php?f=227&t=153628 it seems to have to do with the handling of wide characters where the right half of the character is being presented as a space instead of the rest of the character. restart Konsole and you see a different prompt. I focus on the OP and his screenshot, he uses bash and you only see a prompt which has whitespace. Could be a bug, I don't know. I just added an idea. I installed the kde spin of Fedora 28 in virtualbox and applied all the updates. No issues with default settings. By its very nature, a terminal program requires font characters that are equal width (monospace). Any non monospaced font may cause display issues. This should not be necessary except in rare cases. Do you use a special font in your Konsole profile? 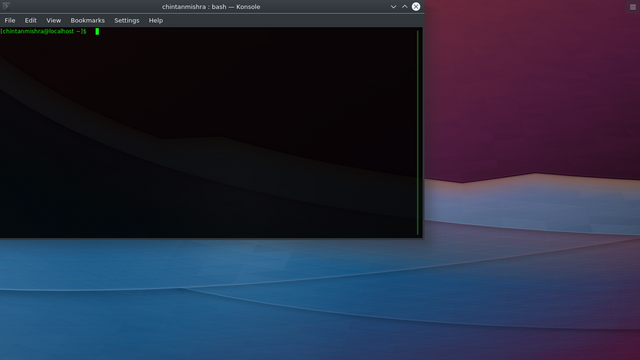 My issue originated when I installed KDE from inside GNOME and removed GNOME.